Robert Luff & Co are delighted to bring to the market this incredibly spacious and well presented, THREE/FOUR BEDROOM DETACHED HOUSE, enviably located on a tucked away just off of Lancing seafront. Lancing is just a couple of minutes' walk away and the Village centre and mainline railway station are within 0.75 mile radius. The 700 bus service passes along the A259 Brighton Road, providing easy access to Brighton, Worthing and further afield. 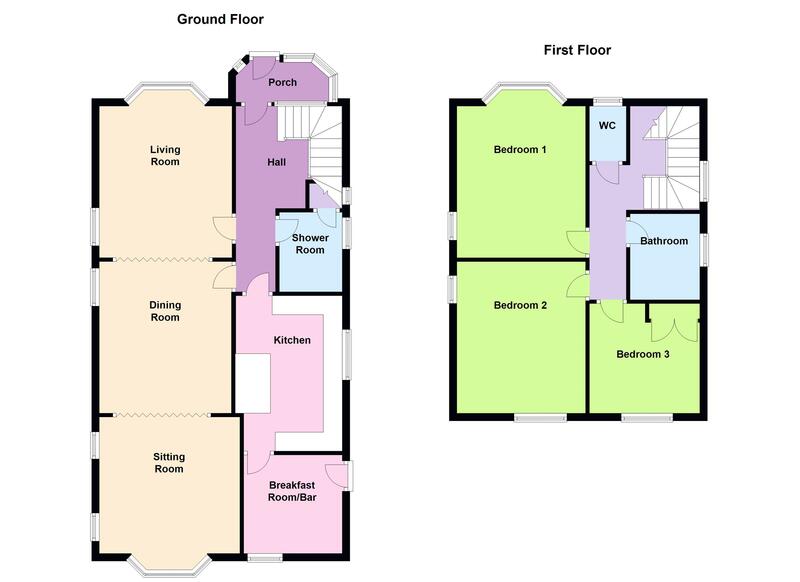 The generous accommodation features: Entrance porch, entrance hall, West facing living room with feature fireplace, separate dining room and further sitting room/bedroom, study/bar room, luxury kitchen with granite work surfaces, ground floor shower room, first floor landing, three double bedrooms, family bathroom and separate WC. Outside, there is an attractive rear garden, double garage and off street parking for multiple vehicles. The property further benefits from a useful loft room with Velux windows. VIEWING ESSENTIAL!! Understairs cupboard, radiator, picture rails stained glass windows, and engineered oak flooring. Single glazed bow window to rear aspect, further windows to side aspect, fitted shutters to the two side windows, two radiators and coved ceiling. Wiindows to rear aspect, single door to side and radiator. Walk in shower enclosure, low level flush WC, wall mounted wash hand basin, cupboard housing boiler, double glazed window to side aspect, further storage cupboard and ladder radiator. Range of fitted white high gloss wall and base units with "Starlight" granite worksurfaces incorporating a stainless steel sink unit with mixer tap and drainer, 'Range' cooker with extractor hood over, integrated washing machine, dishwasher, microwave and fridge, single glazed window to side aspect, breakfast bar and coved ceiling. Double glazed window to side aspect, radiator, picture rail, loft hatch with fold down wooden ladder. Double glazed window to front aspect, stained glass window to side aspect, picture rail, wash hand basin and coved ceiling. Double glazed window to rear aspect, single glazed window, radiator and coved ceiling. Double glazed window to rear aspect, airing cupboard housing hot water cylinder, slatted shelving and shower pump, picture rail and coved ceiling. Bath with telephone style mixer tap and power shower over, pedestal wash hand basin, heated towel rail and fully tiled. Single glazed window to front aspect, low level flush WC and coved ceiling. Two double glazed velux windows, power and light. Fully fence enclosed, mainly laid to lawn with patio, greenhouse and summerhouse. Laid to lawn with mature trees and shrubs.